Cultural Smarts & International Etiquette: India's Hindu Holi Festival! What is the Holi Festival? 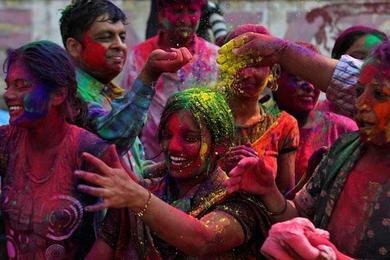 Holi celebrates the arrival of springtime and occurs in late February or March--this year held on March 23 & 24. Holi's first day celebrates the triumph of good over evil, while the second day is considered an expression of universal brotherhood. Holi begins with bonfires during the night of the full moon of the Hindu month of Phalguna. On the second day of the festival, Hindus throughout India and worldwide gather in the streets to celebrate this "festival of colors" by throwing brightly colored powder paint (gulal) and scented water at friends and strangers. Along with general partying, the day is meant for rejoicing about the beautiful colors and new life that arrive with spring. 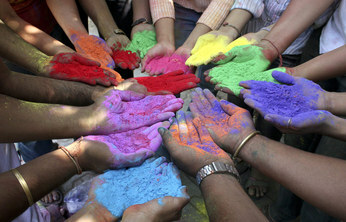 The traditions of Holi come from several legends in Hindu mythology. The public bonfire lit during the rising of the full moon is said to resemble the burning of the demoness Holika. This legend holds that the demon king Hiranyakashipu forbade his son Prahlada from worshiping the God Vishnu, but when Prahlada continued, he became furious. Hiranyakashipu challenged Prahlada to sit on a burning pyre with his aunt Holika, who was gifted with immunity to fire. Surprisingly, Holika was burned to death for using her power for evil, while Prahlada survived unscathed due to his prayers for help and faithful devotion to Vishnu. Another legend associated with Holi is about Krishna, the dark-blue skinned God. When Krishna is rejected by Radha, a fair skinned girl, Krishna's mother tells him to color Radha's face. He does, and they become a happy couple. Holi's colorful, frivolous nature also resembles other tales of the God Krishna playfully splashing the village gopis (cowherds' wives and daughters) with water and colors. Pack Your Adventurous Attitude: On the second day, join in the multicultural ethos and have fun! Having colored water and chalk doused all over me brought back fond memories of childhood. Bring a Change of White Clothing: Bring a change of clothes for the occasion - specifically inexpensive white clothing and tennis-shoes to maximize paint color. Remember paint color does not wash or dry clean out of many fabrics, including silk. Choose Your India Venue Carefully: Prepare in advance and choose wisely when selecting the location where you want to celebrate, because participation is 99% and mobility is restricted on the second day. In addition to honoring Hindu culture, the Holi festival serves as an opportunity to loosen the restrictions of social codes and brings people from all walks of life together. On the second day, caste, class, age, and gender may be disregarded depending on your location, while almost everyone joins the cultural celebration. A popular phrase reflecting this positive attitude is: bura na mano, Holi hai, or "don't be offended, it's Holi!"